Life by Cynthia: My Life in Fast Forward. May Days Gone Too Soon. Since entering motherhood I feel like my life has been whizzing by in fast forward. I can hardly believe that the month has ended! May is one of my favorite months out of the year. It is the month that we celebrate Mother's Day, the month that I became engaged, and the month that I celebrate my birth. The days this month seem to have flown right past me. Our son is growing up so fast and I'm aging even faster! I can hardly believe that I turned 42 years old this year! I'm in denial. I'm fighting the aging process and trying to hang on to what is left of my youth. We had a beautiful afternoon in Coronado to celebrate Mother's Day. The Coronado Ferry Landing is one of our favorite spots! Our son and I had so much fun flying a kite together. 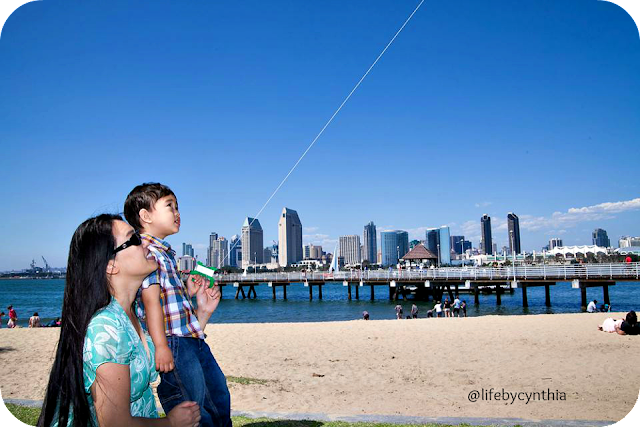 It is the perfect place to fly a kite and to enjoy the beautiful weather & scenery. It is definitely a memory that I will keep forever. I am so grateful to have a photographer in the family! My husband always surprises me with great mom & son photos. I cherish them all! Taking a moment to pause with my son. June is also one of my favorite months! It is the month that our son was born and when we celebrate Father's Day! This year we will be attending a June wedding too! Very exciting! I love weddings! I'm really looking forward to the month ahead! I hope to stop and smell the roses this upcoming month as my May days went by much too soon. How do you slow down? Are Moms even allowed to? I think that's a lovely shot of you both flying a kite. I agree that it seems like time is flying by. I remember when I was pregnant with my son, it seemed as if that went by slowly, especially, those long days toward the tail end of pregnancy. Now that my son is here, time has zipped by and my son is now two. I am trying to so hard to cherish each and every moment because I will blink and he will be in kindergarten, on to middle school, and in graduating high school. It is sad how fast they grow up. Love that pic of you two! Hope you had an incredible day. I love May too. For me it symbolizes all things fresh and new. That's a great photo! PS - There's no way you're 42! I say mid-thirties! May did go by way too fast, and I do love it too. May is a pretty busy month around here, too, which is why the slowness of June is so welcome. Hoping your June provides as much enjoyment as your May did! Time goes by so fast - I appreciate your reminder to stop and smell the roses! We share a lot of things in common with May and June! love the moment captured.... excellent shot.